The wait is over. The new “Go week” has been revealed! Last week in chapel, Joel Mullen brought excitement to students. He shared the stage with Eileen Ruger, Liliana Reza and a few students who shared their experience from studying abroad, Commissions to Mexico (Com2Mex), and Southern Nazarene in Missions (SIMS). 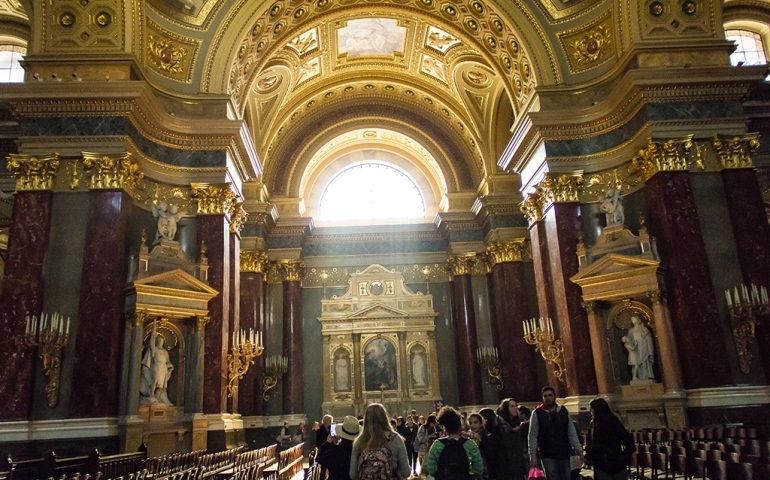 Studying abroad offers students to take courses and do ministry overseas. Students can study in various locations found in Africa, Asia, Europe, and Latin America. The duration of the trip can vary from one to four months, or a full academic year. Students who are interested can visit http://veritasabroad.com for more information or contact Eileen Ruger. Students may also find brochures on the front tables of the Commons that provide more details. Serve Groups was another area mentioned. The first event took place at “Reaching Our City” on September 15. Students who are interested in further opportunities to serve, throughout the semester, can find more information by emailing Liliana Reza or Luke Luker. Want to spend the New Year in Mexico? Eileen Ruger introduced Commissions to Mexico, which grants students the opportunity to be a part of a short mission trip over the Christmas break. Working in the Monterrey community, students will be part of refurbishing Nazarene churches and parsonages, holding vacation Bible schools, ministering in mobile medical units and sports camps. The dates of “Com2Mex” is December 27 to January 2. Everything one needs to know about this trip can be found in this link, http://snu.edu/mexico, or from Eileen Ruger. The 2017 SIMS locations have been announced. Featuring 23 teams in 21 countries, students have the opportunity to spend their summer doing mission work around the globe. These trips range from 2-6 weeks in places like Italy, Australia, Romania and South Africa. Unsure where God is leading one to serve? Take a leap of faith by joining a mystery team, as SIMS is now offering 3 secret locations. Students will train throughout the year unaware of their location (somewhere outside of North America) until the day they depart. SIMS mystery team is recorded to be the most requested team, as 33% of students list this group as their top preference. SIMS also added 3 music teams, which will allow students with musical gifts to focus on music ministry for the summer. One of the biggest concerns students have that cloud their judgement, on going on a SIMS trip, is the cost. To that, Joel Mullen exclaims, “God will provide!” He says, “We’ve seen over and over, the people who take a step of faith, and do their part in fundraising make their goal.” What is God asking you to do? Students who have an interest in joining SIMS should sign up today by filling out an interest form and/or application from the links posted below. The deadline is Monday, October 31 at 5:00p.m.